Compliance boundaries create logical boundaries within an Office 365 organization that control the user content locations (such as mailboxes, SharePoint sites, and OneDrive accounts) that eDiscovery managers can search. Additionally, compliance boundaries control who can access eDiscovery cases used to manage the legal, human resources, or other investigations within your organization. The need for compliance boundaries is often necessary for multi-nations corporations that have to respect geographical boarders and regulations, and for governments, which are often divided into different agencies. In Office 365, compliance boundaries help you meet these requirements when performing content searches and managing investigations with eDiscovery cases. We'll use the example in the following illustration to explain how compliance boundaries work. 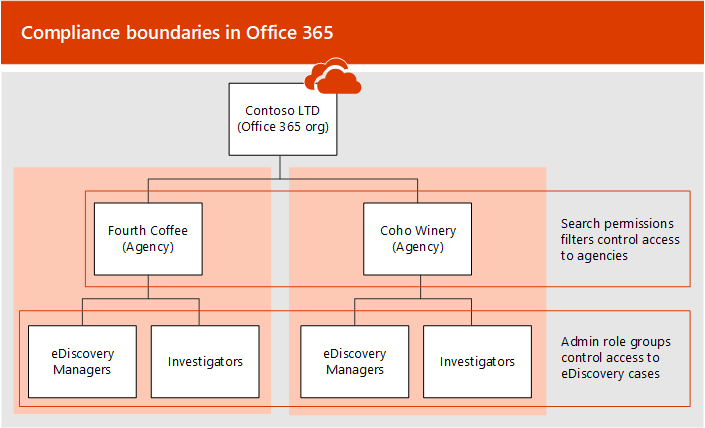 In this example, Contoso LTD is an Office 365 organization that consists of two subsidiaries, Fourth Coffee and Coho Winery. The business requires that eDiscovery mangers and investigators can only search the Exchange mailboxes, OneDrive accounts, and SharePoint sites in their agency. Additionally, eDiscovery managers and investigators can only see eDiscovery cases in the in their agency, and they can only access the cases that they're a member of. Here's how compliance boundaries meet these requirements. The search permissions filtering functionality in Content Search controls the content locations that eDiscovery managers and investigators can search. This means eDiscovery managers and investigators in the Fourth Coffee agency can only search content locations in the Fourth Coffee subsidiary. The same restriction applies to the Coho Winery subsidiary. Role groups control who can see the eDiscovery cases in the Security & Compliance Center. This means that eDiscovery managers and investigators can only see the eDiscovery cases in their agency. Role groups also control who can assign members to an eDiscovery case. This means eDiscovery managers and investigators can only assign members to cases that they themselves are a member of. The first step is to choose an Azure Active Directory attribute to use that will define your agencies. This attribute will be used to create the search permissions filter that limits an eDiscovery manager to search only the content locations of users who are assigned a specific value for this attribute. For example, let's say Contoso decides to use the Department attribute. The value for this attribute for users in the Fourth Coffee subsidiary would be FourthCoffee and the value for users in Coho Winery subsidiary would be CohoWinery. In Step 4, you'll use this attribute:value pair (for example, Department:FourthCoffee ) to limit the user content locations that eDiscovery managers can search. Although more user attributes are available, particularly for Exchange mailboxes, the attributes listed above are the only ones currently supported by OneDrive. The next step is to file a request with Microsoft Support to synchronize the Azure Active Directory attribute that you chose in Step 1 to all OneDrive accounts in your organization. After this synchronization occurs, the attribute (and its value) that you chose in Step 1 will be mapped to a hidden managed property in SharePoint named ComplianceAttribute. You'll use this attribute to create the search permissions filter for OneDrive in Step 4. The following title or description of the purpose of the support request: "Enable OneDrive for Business Synchronization with Azure Active Directory for Compliance Security Filters". This will help route the request to the Office 365 eDiscovery engineering team who will implement the request. After the engineering change is made and the attribute is synchronized to OneDrive, Microsoft Support will send you the build number that the change was made in and an estimated deployment date. Note that the deployment process usually takes 4-6 weeks after you submit the support request. Important: You can complete Step 3 through Step 5 before the change is deployed. But running content searches won't return documents from OneDrive sites specified in the search permissions filter until after the change is deployed. The next step is to create the role groups in the Security & Compliance Center that will align with your agencies. We recommend that you create a new role group by copying the built-in eDiscovery Managers group, adding the appropriate members, and removing roles that may not be applicable to your needs. For more information about eDiscovery-related roles, see Assign eDiscovery permissions in the Office‍ 365 Security & Compliance Center. To create the role groups, go to the Permissions page in the Security & Compliance Center and create a role group for each team in each agency that will use compliance boundaries and eDiscovery cases to manage investigations. Using the Contoso compliance boundaries scenario, four role groups need to be created and the appropriate members added to each one. After you've created role groups for each agency, the next step is to create the search permissions filters that associate each role group to its specific agency and defines the compliance boundary itself. You need to create one search permissions filter for each agency. For more information about creating security permissions filters, see Configure permissions filtering for Content Search. Here's the syntax that's used to create a search permissions filter used for compliance boundaries. FilterName - Specifies the name of the filter. Use a name that describes or identifies the agency that filter will be used in. Users - Specifies the users or groups who get this filter applied to the Content Search actions they perform. For compliance boundaries, this parameter specifies the role groups (that you created in Step 3) in the agency that you're creating the filter for. Note this is a multi-value parameter so you can include one or more role groups, separated by commas. Filters - Specifies the search criteria for the filter. For the compliance boundaries, you will define the following filters. Each one applies to a user content location. Mailbox - Specifies the mailboxes that the role groups defined in the Users parameter can search. For compliance boundaries, ComplianceAttribute is the same attribute that you identified in Step 1 and AttributeValue specifies the agency. This filter allow members of the role group to only search the mailboxes in a specific agency; for example, "Mailbox_Department -eq 'FourthCoffee'" . Site - Specifies the OneDrive accounts that the role groups defined in the Users parameter can search. For the OneDrive filter, use the actual string ComplianceAttribute; this will map to the same attribute that you identified in Step 1 and that's synchronized to OneDrive accounts as a result of the support request that you submitted in Step 2; AttributeValue specifies the agency. This filter allow members of the role group to only search the OneDrive accounts in a specific agency; for example, "Site_ComplianceAttribute -eq 'FourthCoffee'". Site_Path - Specifies the SharePoint sites that the role groups defined in the Users parameter can search. The SharePointURL specifies the sites in the agency that members of the role group can search; for example, "Site_Path -like 'https://contoso.sharepoint.com/sites/FourthCoffee*'"
Action - Specifies the type of Compliance Search action that the filter is applied to. For example, -Action Search would only apply the filter when members of the role groups defined in the Users parameter runs a content search. In this case, the filter wouldn't be applied when exporting search results. For compliance boundaries, use -Action All so the filter applies to all search actions. For a list of the Content Search actions, see the "New-ComplianceSecurityFilter" section in Configure permissions filtering for Content Search. Here are examples of the two search permissions filters that would be created to support the Contoso compliance boundaries scenario. Only members of the role group added to the case will be able to see and access the case in the Security & Compliance Center. For example, if the Fourth Coffee Investigators role group is the only member of a case, then members of the Fourth Coffee eDiscovery Managers role group (or members of any other role group) won't be able to see or access the case. Go to the eDiscovery page in the Security & Compliance Center and create a new case. In the list of eDiscovery cases, click the name of the case you just created. In the Manage this case flyout page, under Mange role groups, click Add. In the list of role groups, select one of the role groups that you created in Step 3, and click Add. Click Save on the Manage this case flyout to save the change. Keep the following limitations in mind when managing eDiscovery cases and investigations that use of compliance boundaries. When creating and running a Content Search, you can select content locations that are outside of your agency. However, because of the search permissions filter, content from those locations won't be included in the search results. Compliance boundaries don't apply to holds in eDiscovery cases. That means an eDiscovery manager in one agency can place a user in a different agency on hold. However, the compliance boundary will be enforced if the eDiscovery manager searches the content locations of the user who was placed on hold. That means the eDiscovery manager won't be able search the user's content locations, even though they were able to place the user on hold. Additionally, hold statistics will only apply to content locations in the agency. Search permissions filters aren't applied to Exchange public folders. Search permissions filters also let you control where content is routed for export and which datacenter can be searched when searching content locations in a SharePoint Multi-Geo environment. Export search results - You can export the search results from Exchange mailboxes, SharePoint sites, and OneDrive accounts from a specific datacenter. This means that you can specify the datacenter location that search results will be exported from. Use the Region parameter for New-ComplianceSecurityFilter or Set-ComplianceSecurityFilter cmdlets to create or change which datacenter the export will be routed through. Route content searches - You can route the content searches of SharePoint sites and OneDrive accounts to a satellite data center. This means you can specify the datacenter location where searches will be run. Use the following values for the Region parameter values to control which datacenter that Content Searches will run in when searching SharePoint sites and OneDrive locations. Note that the following table also shows which datacenter exports will be routed through. If you don't specify the Region parameter for a search permissions filter, the organizations default SharePoint region will be searched, then search results are exported to the closest datacenter. Here are examples of using the Region parameter when creating search permission filters for compliance boundaries. This assumes that the Fourth Coffee subsidiary is located in North America and that Coho Winery is in Europe. Keep the following things in mind when searching and exporting content in multi-geo environments. The Region parameter doesn't control searches of Exchange mailboxes; all data centers will be searched when you search mailboxes. To limit the scope of which Exchange mailboxes can be searched, use the Filters parameter when creating or changing a search permissions filter. If it's necessary for an eDiscovery Manager to search across multiple SharePoint regions, you'll need to create a different user account for that eDiscovery manager that can be used in the search permissions filter to specify the alternate region where the SharePoint sites or OneDrive accounts are located. When searching for content in SharePoint and OneDrive, the Region parameter directs searches to either the main or satellite location where the eDiscovery manager will conduct eDiscovery investigations. If an eDiscovery manager searches SharePoint and OneDrive sites outside of the region that's specified in the search permissions filter, no search results will be returned. When exporting search results, content from all content locations (including Exchange, Skype for Business, SharePoint, OneDrive and other Office 365 services that you can search by using the Content Search tool) will be uploaded to the Azure storage location in the data center that's specified by the Region parameter. This helps organizations stay within compliance by not allowing content to be exported across controlled borders. If no region is specified in the search permissions filter, content is uploaded to the organization's default region. Who can create and manage search permissions filters (using New-ComplianceSecurityFilter and Set-ComplianceSecurityFilter cmdlets )? 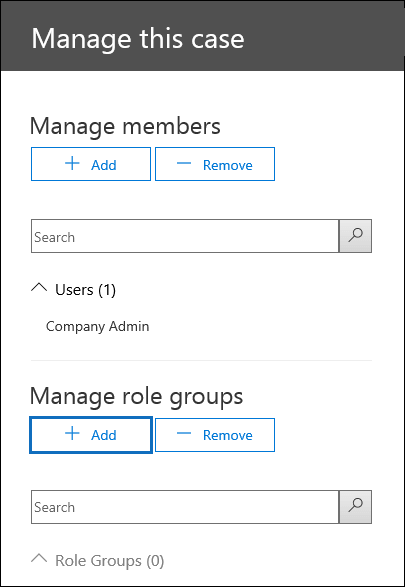 To create, view and modify search permissions filters, you have to be a member of the Organization Management role group in the Security & Compliance Center. If an eDiscovery manager is assigned to more than one role group that spans multiple agencies, how do they search for content in one agency or the other? The eDiscovery manager can add parameters to their search query that will restrict the search to a specific agency. For example, if an organization has specified the CustomAttribute10 property to differentiate agencies, they can append the following to their search query to search mailboxes and OneDrive accounts in a specific agency: CustomAttribute10:<value> AND Site_ComplianceAttribute:<value>. What happens if the value of the attribute that's used as the compliance attribute in a search permissions filter is changed? It takes up to 3 days for a search permissions filter to enforce the compliance boundary if the value of the attribute that's used in the filter is changed. For example, in the Contoso scenario let's say that a user in the Fourth Coffee agency is transferred to the Coho Winery agency. As a result, the value of the Department attribute on the user object is changed from FourthCoffee to CohoWinery . In this situation, Fourth Coffee eDiscovery and investors will get search results for that user for up 3 days after the attribute is changed. Similarly, it will take up to 3 days before Coho Winery eDiscovery managers and investigators will get search results for the user. Can an eDiscovery manager see content from two separate compliance boundaries? Yes. This can be done by adding the user to role groups that have visibility to both agencies. Do search permissions filters work for eDiscovery case holds, Office 365 retention policies, or DLP? If I specify a region to control where content is exported, but I don't have a SharePoint organization in that region, can I still search SharePoint? If the region specified in the search permissions filter doesn't exist in your organization, the default region will be searched. What is the maximum number of search permissions filters that can be created in an organization? There is no limit to the number of search permissions filters that can be created in an organization. However, search performance will be impacted when there are more than 100 search permissions filters. To keep the number of search permissions filters in your organization as small as possible, create filters that combine rules for Exchange, SharePoint, and OneDrive into a single search permissions filter whenever possible.